The evening will begin at 6 p.m. with mingling, food and a cash bar. 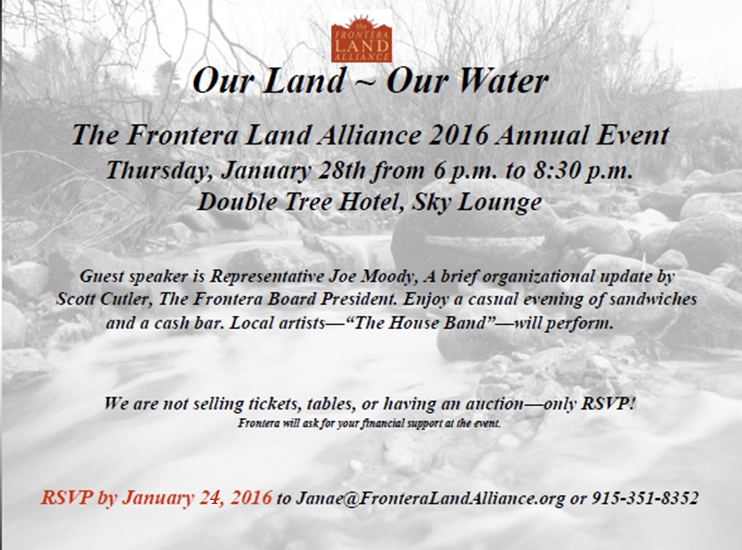 Representative Moody will be our guest speaker, followed by an update on the efforts to make Castner Range a National Monument and the Frontera 2016 programs and projects by Frontera President, Scott Cutler. Make Castner Range a National Monument! Act now! YOU can make Castner Range a National Monument! Thank you, to each one of you! Our members and volunteers make conservation happen in the region! And we could not carry out water, wildlife and natural area conservation without our sponsors and grantors which include: El Paso Electric Company, James A. “Buddy” Davidson Charitable Foundation, Norcross Wildlife Foundation Inc., CSM Realty Holdings, LTD., Estate of Maxie Groce Templeton honoring Judy Ackerman for her conservation efforts, Richard Teschner, Hunt Communities, Jobe Materials, CMD Endeavors, Winton Flair, Bain Construction, and Sierra Machinery.